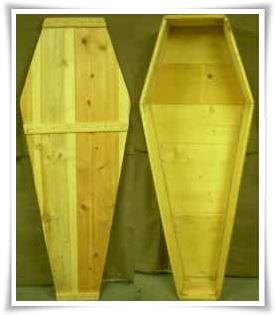 While not pleasant, knowing how to build a casket is a skill that you unfortunately may need in a crisis. The reality is that if there is a period of wholesale lawlessness following a global economic collapse, you may end up needing to bury those close to you. If you have to do it, knowing the proper way to do it is going to be more comforting than just dropping a body in a trench somewhere. The overall length for a casket made with these specifications is 80L x 26W x 18D. When it comes to tools you’re going to need Elmer’s wood glue, screws or nails, thick cotton rope for the handles. Since you are learning how to build a casket rather than buying one, you will also need access to a drill, bits and a skill saw. Of course, if you have access to a table saw that would even be better. Before you begin to build anything, cut all of the wood you need first before laying out the pieces in an organized fashion to make sure you haven’t missed anything. This is where you’re going to need your tools like; a hammer, nails or screws, a drill, and some sort of saw. You can use a handheld saw but it’s going to be much easier if you have access to a table saw. This is because some of the pieces you are cutting are going to be large, so it’s going to be difficult to master those cuts with a hand saw. You can use nails or screws but if you want to know how to build a casket without them it is feasible, however, this will take a lot more time. You have to both glue and screw each piece together. The glue will have to set for 24 hours before you can safely remove the screws but while it’s time consuming; the result is a nice, clean, naturally built casket that you can be proud to say you made. What better way to honor a friend or family member than by learning how to build a casket for them. Rather than spending thousands of dollars on a cold impersonal final resting place for your loved one why not do it yourself? If you make your own casket, you can add in personal touches that remind you of the person you have just lost. This can be a therapeutic way to say goodbye to the person you loved. You can finish your casket in such a way to capture its natural wood look or bring out your inner artist and decorate the casket. Regardless of your tribute, creating a unique, well built casket is a special way to not only dispose of your dead but to also say goodbye and grieve their loss as well.